Procter & Gamble: Buy at the High? Investors have been disappointed by P&G's growth rebounds in the past, but this time looks different. Not many stocks are marking new highs these days, as the major market indexes have declined about 10% since early October. But Procter & Gamble (NYSE:PG) is a different story. The consumer products giant's stock price has jumped 20% in the past 3 months, to climb back into positive territory for the year (where it hasn't been since January) and set a new all-time high. The company has generated brief periods of investor optimism like this one in recent years, only to disappoint shareholders by downgrading its growth outlook. 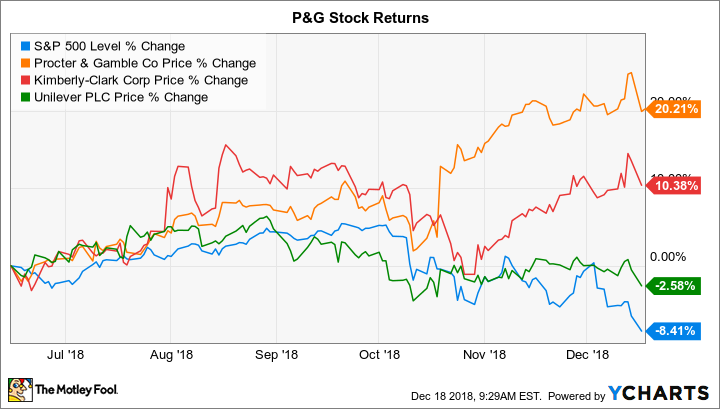 However, there are some differences in P&G's circumstances today that could support the continuation of this stock rally well into 2019. Shareholders haven't had much to celebrate in the way of sales growth lately: P&G underperformed its targets in each of its last two fiscal years. Organic sales grew at a meager 1% in fiscal 2018, a slowdown from the prior year's 2% boost. Conditions are looking much stronger in fiscal 2019, though. In fact, P&G just posted its fastest expansion pace in years, with revenue rising 4% in its fiscal first quarter, which ended Sept. 30. This boost included hefty volume gains, which implies market share growth in key areas like laundry and skin care. That idea is supported by the fact that rival Kimberly Clark (NYSE:KMB) is growing at just a 1% pace right now. Profits, on the other hand, haven't been as much of a concern for P&G through its multiyear growth slump. Thanks to aggressive cost cutting, it has expanded its operating margin has to an industry-leading 20% or so of sales. The good news is this metric could improve over the next few quarters as the company rolls out price increases across its portfolio. Management has resisted boosting prices aggressively in recent years, but the timing seems right given P&G's stronger growth trends. Other industry players, including Kimberly Clark and Unilever (NYSE: UL), are raising prices too, and so it isn't likely to weaken its market position. P&G in early November affirmed a full-year outlook that predicts its growth rate will land at between 2% and 3% -- doubling or even tripling the prior year's result. Core earnings should rise a bit faster, and those financial returns will be boosted by stock buybacks and rising dividend payments. Investors are likely finding themselves drawn to this stock for other reasons that could prove temporary. With markets looking shaky right now and fears rising of a global economic slowdown, it makes sense to gravitate toward a high-quality dividend stock that dominates big consumer staples niches like diapers, paper towels, and skin care. That idea looks even better if the company appears to be at the beginning of a growth rebound that has evaded it for several years. Once the current period of market volatility fades, the flight to quality blue-chip stocks might reverse itself just as quickly as it came on. But P&G's improving growth results and robust earnings might support continued gains for shareholders, especially since the stock has lagged its peers through most of the last five years.